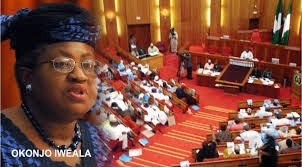 The House of Representatives Public Accounts Committee (PAC) on Wednesday gave the Coordinating Minister for the Economy and Minister of Finance , Dr Ngozi Okonjo-Iweala, one week to furnish it with the PricewaterhouseCoopers (PwC) forensic audit report on the alleged un-remitted $20 billion by the Nigerian National Petroleum Corporation (NNPC). This follows a resolution mandating PAC to look into the matter last week. The report to be submitted to the House "must include the Initial Draft Report, the Executive Summary and Management/Internal Control Letters." Hon. Solomon Adeola Olamilekan (APC, Lagos), who is PAC's chairman, told journalists that since the release of a "condensed version" of the report to the public through a press conference addressed by the Auditor-General of the Federation with the highlight that Nigeria National Petroleum Corporation (NNPC) should remit a minimum of $1.48 billion to the Federation Account, several demands for the full report by the committee did not yield any good result. He said: "Given the weighty allegation of possible loss of $20 billion to the Federation Account arising from alleged non-remittance by NNPC through the ministry of finance, it is curious that the forensic audit was commissioned and appointment of auditors was made by the minister of finance, an indictable official, if allegation is proven, without the involvement or at least input of the Auditor-General, whose office is eminently and exclusively empowered for the duty by the 1999 Constitution." He further noted: “The report has been unduly delayed and its submission also side-stepped the Auditor-General. It is a professional best practice that such reports first come in draft, discussed and fine-tuned before the release of the final report, usually accompanied by the more detailed ‘Management Letter’.” The committee chairman argued that by virtue of Section 85 (6) of the constitution, the Auditor-General ought not to be directed by the president to deal with the report in a particular manner, saying no reference was made on the need to send the report to the National Assembly, where PAC would deal with it as provided in the constitution.